1. Foreman (Electrical) Grade (S-5) - Diploma in Engineering in Electrical / Electrical & Electronics with minimum 60% marks. + Minimum 2 (Two) years postqualification experience in line in Cross Country Hydrocarbon Pipelines/ Hydrocarbon Process Plants (i.e. Refinery, Petrochemicals and Fertilizer plants only) of a State/Central Government Undertaking(s) and/or Large Private Sector Organization(s) of repute, as an employee of that Plant/Undertaking /Organization. 2. Foreman (Instrumentation) Grade (S-5) - Diploma in Engineering in Instrumentation/Instru mentation & Control/ Electronics & Instrumentation / Electrical & Instrumentation/ Electronics/ Electrical & Electronics with minimum 60% marks. + Minimum 2 (Two) years postqualification experience in line in Cross Country Hydrocarbon Pipelines/ Hydrocarbon Process Plants (i.e. Refinery, Petrochemicals and Fertilizer plants only) of a State/Central Government Undertaking(s) and/or Large Private Sector Organization(s) of repute, as an employee of that Plant/Undertaking/ Organization. 3. Junior Chemist Grade (S-5) - Full time Master Degree (M.Sc.) in Chemistry with minimum 55 % marks. + Minimum 2 (Two) years Postqualification experience in line in Quality Control Laboratory of an organization in Hydrocarbon Industry like Oil Refineries, Gas Processing Process Plants, Petrochemical Plants or Fertilizer, Steel, Chemical or other relevant process industries in State/Central/ Government Department(s) Institution(s)/ Undertaking (s) and/or Large Private Sector Organisation(s) / Institution(s)/ Company (ies) of repute, as an employee of that Institution/ Undertaking/ Organisation. 4. Junior Superintendent (Official Language) Grade (S-5) - Full time Bachelor Degree of minimum 03 years duration in Hindi Literature with minimum 55% marks and Degree or Diploma in translation in Hindi to English and vice-versa from any recognised University or equivalent. Should have English as one of the subjects in Graduation. Candidates should have basic knowledge & skills in computer applications (MS Office etc.) in office environment. + Minimum 03 (Three) years Post Qualification experience in line in English to Hindi translation and viceversa of various reports, documents, letters etc., preferably in State/Central Government/Public Sector Undertaking(s)/ Large Bank(s)/Financial Institution(s) of repute as an employee of that Undertaking/ Bank/Financial Institution/ Organisation. 5. Assistant (Stores & Purchase) Grade (S-3) - Full time Bachelor Degree of minimum 03 years duration with minimum 55% marks. Candidates should have basic knowledge & skills in computer applications (MS Office etc.) in office environment. + Minimum 1 (One) year Post Qualification Experience in the Stores/Contract & Procurement/ Materials Management or equivalent Department in State/Central Govt. Department/ Organization(s)/ Undertaking(s) and/or Large Private Sector Organization(s)/ Institution(s)/ Company (ies) of repute. 6. Accounts Assistant Grade (S-3) - Full time Bachelor Degree of minimum 03 years duration in Commerce (B. Com) with minimum 55% marks. Candidates should have basic knowledge & skills in computer applications (MS Office etc.) in office environment. 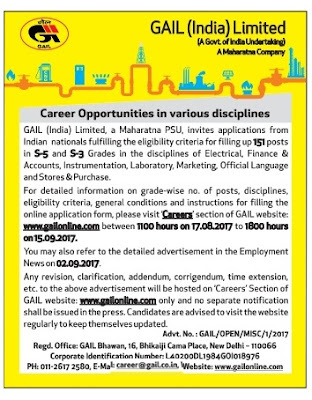 + Minimum 1 (One) year Post Qualification Experience in Finance/Accounts or equivalent Department in State/Central Govt. Department/Organization(s)/ Undertaking(s) and/or Large Private sector Organization (s)/ Institution(s)/ Company (ies) of repute. 7. Marketing Assistant Grade (S-3) - Full time Bachelor Degree of minimum 03 years duration in Business Administration (BBA/BBS/BBM/BMS) with minimum 55% marks. Candidates should have basic knowledge & skills in computer applications (MS Office etc.) in office environment. + Minimum 1 (One) year Post Qualification Experience in Sales/ Marketing or equivalent in State/Central Govt. Department/ Organization (s)/Undertaking(s) and/or Large Private Sector Organization/ Institution(s)/Company (ies) of repute.